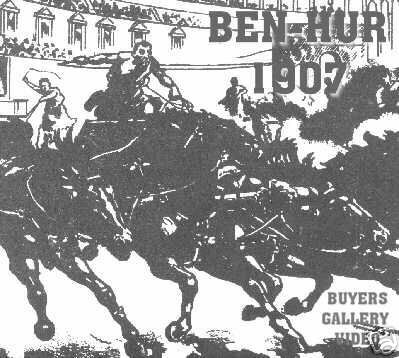 The new 4 disc box-set of Ben Hur includes the full version of the 1925 version, but it also includes a few snippets from the 1907 version. It's kind of a shame that they didn't include all of this film too, at 15 minutes long it would hardly have stretched the potential of the 4 DVDs. Still it's great to have even this, and as it's there as part of a documentary you get some useful background information as well. 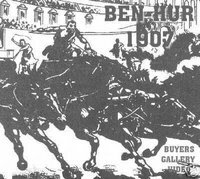 One such random fact is that this version, the original I suppose, didn't stage it's own chariot race, as the 2 later re-makes would do. Instead they took a camera down to an annual chariot race competition and recorded part of that. The 1907 version is best known as the film that shaped movie copyright laws. Kalem failed to gain permission from the Wallace estate, and, as a result, were sued for $25,000 for copyright infringement. This groundbreaking case set a precedent for all future adaptations.